Epson Label Printer TM-C3400 and TM-C3510 deliver high-quality colour labels on-demand to improve efficiencies and reduce labelling costs. With a high printing speed of up to 103mm per second, excellent resolution and reliability, these printers are the perfect choice for industrial, chemical, warehousing, medical and other labelling applications. 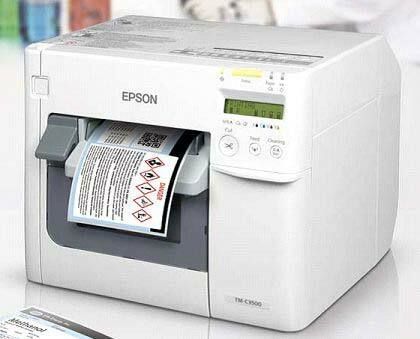 Now you can do away with expensive pre-printed labels and simply print them whenever you need. Colour Labels On-Demand : Designed to meet the needs of high-mix, low-volume applications that require multiple label variations. Print colour codes, images and pictograms to highlight relevant information Easily. Designed to meet the needs of customers producing high-mix, Low-volume applications, the TM-C3510 and TM-C3400 allow you to print Multiple label variations in a breeze, improving product identification and productivity. * With printing speeds at up to four inches per second and a new 4-colour system, these printers deliver stunning image resolution. The addition of black ink increases the range of colour customers can reproduce. Better Inventory Management : Save up to 50% on labelling costs by Reducing the need to stock up on different types of pre-printed labels. On-demand printing means you don’t have to stock up on expensive pre-printed colour labels you may never use. By leveraging the printers’ On-demand colour labelling technology, you save up to as much as 50% on labelling costs and increase work productivity. BS5609 Certified : Printers, used together with pigment inks and Approved media are BS5609 certified to print GHS-compliant labels. Meet your regulatory requirements within the chemical industry with GHS-compliant labels. Both the TM-C3510 and TM-C3400 label printers, Epson’s pigment inks and its wide variety of approved media are also BS5609 certified, making these label printers the ideal low-cost solution For the GHS market. Superior Print Quality : Ensure sharp print images on every label. Epson’s patented MicroPiezo®inkjet technology together with our pigment inks ensure labels with crisp,clear, easy-to-read text, barcodes and vibrant graphics that are long-lasting,quick-drying and fade resistant. The printouts are resistant to smudges andwater, even on paper. Wide Variety of Media : Print on a wide range of media and enjoy on-demand colour labels inany environment. From plain, synthetic, matte to glossy stock, theTM-C3510 and TM-C3400 ensure labels of superior print quality, givingyou sharp graphics. These label printers also handle roll, fanfold, die cutor continuous label media. Ease-of-use and Maintenance : The TM-C3510 and TM-C3400 are compact and support all majorlabel software applications. Easy installation and maintenance allowmanufacturers to monitor ink supply levels on an LCD display* and overseemultiple network printers in a system, reducing set-up time and minimisingoperational delays. Environmental Protection : Unlike thermal printers or other inkjet technologies, Epson’s MicroPiezo®inkjet technology uses no heating components. This means that energyconsumption is extremely low during printing or in standby mode.In addition, the TM-C3510 and TM-C3400 are compliant with RoHS(Restriction of Hazardous Substances) and WEEE (Waste Electrical and Electronic Equipment) directives, thus ensuring continued contribution tothe protection of our environment.